I started creating YouTube videos (here is my channel) back in 2013. Here is my first video and it is really bad! Lol. I remember, that I saw a couple of fashion videos back then and I thought to myself that I can do that too. I had no clue about YouTube at all and how much success some YouTubers have. My first videos were all only OOTD (outfit of the day) videos with a little (bad) background- music (bad because you can´t use good songs as they are copyrighted!) and I swore to myself, that I will never ever talk in one of my videos. However, a couple weeks later that changed, because someone tagged me and I felt I had to answer a couple of questions in a video. And there: I uploaded my first video in which I actually talked! Geez! Was I excited! This felt weird! Unfortunately I deleted that video years later, because I really hated how I talked and looked- I wish I would not have, as I would love to watch it today and laugh about it. Yes! YouTube was so different in 2013 y'all! Not only did I enjoy watching other channels- even though the quality of the videos- like literally the image quality or even sound quality- was so much worse then today. But it felt REAL! You know what I mean? Today every 14 year old knows how to edit videos and they create the craziest high quality videos with intros, nice background, special effects and all. Even my subscribers changed. In my first years on YouTube I had real people commenting on my videos. They were nice and super sweet and even helpful (though some of them stayed with me over the years! Thank you, ladies!). You have to know that I had no clue about makeup at all and I wasn´t there to explain to anybody how to do anything, I was just chatting with them and actually my subscribers were "my friends" who helped me with shopping choices and gave me tips! So, what changed? Today, most of my comments that I receive on my videos are from other ladies, that also have a YouTube channel and are trying to promote it. The -in most cases- only reason they leave a comment on my video is to get "discovered" by my subscribers or even to get me to subscribe to their channel. YouTube has gotten so competitive! Everybody just wants so "succeed"- whatever that means. And it has gotten really unfriendly too! While my first videos were actually quiete horrible- cause you know I am not exactly good in creating a makeup tutorial lol (here is a good- I mean bad- example)- people still were friendly and I felt welcome. 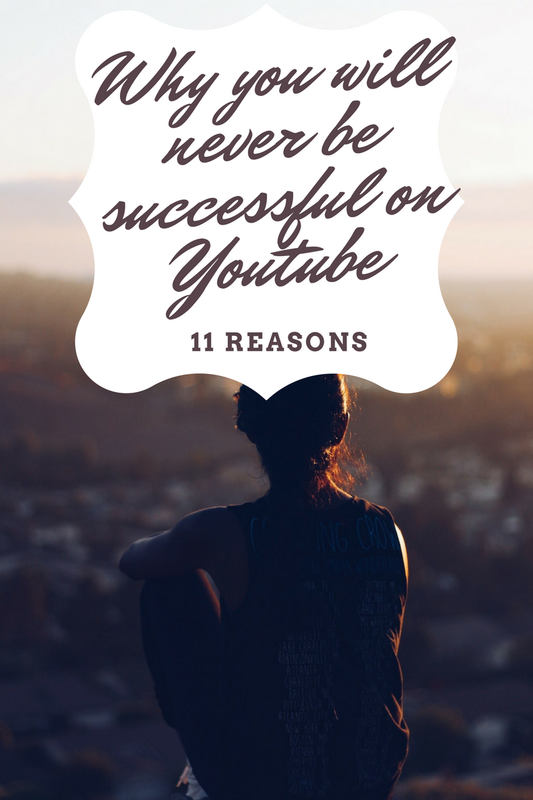 11 reasons, why you (and I) will never be successful on YouTube! I know this hurts, and you (and I) might even think: No! I am funny! But: it isn´t always very easy to translate that inner personality onto the tiny (in most cases smartphone-)screen. You might be a funny cracker in real life- but do people see that in your videos? OK- this might be especially the case for beauty channels- but it can be helpful for all kinds of categories, of course people like to see pretty faces! They want the proof that you are actually good in whatever you are promoting. If you create makeup tutorials, of course it looks nicer if you have a pretty face! If you are explaining your skin care routine- well you better have great skin to show off- otherwise why would anybody trust your reviews? 3. You (and I) are not ugly enough! What? Ugly enough? Yep, it actually can be helpful to look ugly- whatever that means- but let´s take the example of having severe acne: if you can show how to master to cover up all those pimples, well that will give you definitely a head-start and other girls that suffer from the same condition will subscribe to your channel. Or if you aren´t that pretty (I mean clearly who defines pretty- so I am just gonna let that stand there without explanation) without makeup and then show us how to make yourself pretty- helpful! I´ve seen huge channel success where YouTubers exploit even their own disabilities, even a channel of a women that does not have arms or legs anymore (due to a disease). Well, it makes these people on YouTube special- especially if they are still able to be positive about it. But please don´t cut your arm off now to have success on YouTube! 4. You (and I) are too honest! How can it be a disadvantage to be too honest you ask? Oh! For many reasons! People want to believe in their miracles! If nothing helps to look prettier, then all hope is lost! So people want to believe in products such as the Detox tea that slims you down, Beenigma cream that reduces wrinkles (read here why I don´t), miracle gummy bears that make your hair grow and so on. YouTube is full of sh!t recommendations and only barely do "Anti-haul" videos really get popular. So, if you don´t hop on the band-wagon and swear by all the miracles out there- you are too honest and people loose their hopes. They want a channel that gives them promises AND HOPE! (On the other hand, sometimes YouTubers have gotten famous for calling out bs- such as Stephanie Nicole who investigated that Kylie Jenner lipsticks are actually just cheap Colourpop lippies). You (and I) don´t use filters! YouTube is fake y'all (all social media is!). I see it on all the big channels- just look at Tati´s videos. That women has absolutely no pores or wrinkles anymore in her videos. And I mean even a 20 year old has skin (skin includes pores and wrinkles- always!) and she is in her 30s. We all have skin and we all have pores! I am sure Tati looks lovely in real life- but you can´t see anything on her videos. Nobody can tell me, that she has no pores or wrinkles! It seems to me that people like to see a face like that on YouTube. They want to think that it is possible to look like that. BUT IT IS NOT! No foundation does that! A filter does! So, if you want to be successful on Youtube, you better use filters! Filter the crap out of your face! You (and I) are not buying subscribers! Yes, I said it! Some YouTubers buy themselves subscribers! Cause when you have already a chunk of subbies, others might sub too, cause you gotta be important if you have that many subbies, right? You know - just like in high school- there are little groups of like-minded people on YouTube that help each other- do shoutouts and such. But, just like in high school: if you never make it into any group, you are left out. I´ve witnessed a couple of little "scandals". (One lady created a list of mature YouTubers and some felt left out because they weren´t on the list and such and were calling each other out for that. This is really just like high-school behavior). Because YouTube has evolved so much and technology along with it, you have to be on top of your game! You have to know it all: how to create amazing close-ups, how to have amazing backgrounds, have the best music and if you are a beauty channel: how to blur out pores and wrinkles and how to create stunning makeup tutorials. Of course you need the best camera, the diva ring light, umbrella lights, editing software. So be prepared to spend a lot! Let´s take myself as an example- OK I am not a native English speaker, so that is of course a huge disadvantage. You have to be able to describe things in depth and not use over and over the same phrases. If I watch my own videos, I notice how often I say: "this is really amazing!" and don´t really have a good explanation on why. This is definitely something that Tati is good at: she explains everything well and has a good variety in words. This is a little different from the other point, because it can be really annoying to listen to an accent, that you are not used to. So even if you talk "well", the accent might trigger something in the viewer. I do have a German accent and some people do like it but others hate it. But the same can be true, if you just have a dialect- a southern accent (y'all! ), or a NY accent or maybe Canadian or Australian or New Zealand! I totally get it! If you are not used to accents, it just can be simply annoying to the viewer, so it might hurt your success. This is a topic that nobody talks open about. Everybody claims that they do YouTube for fun and not for the money. I am gonna admit that even in 2013 I saw from the beginning the possibility to maybe make a little money on YouTube. As long as you are creating helpful or entertaining videos, why not? It´s not that your subscribers pay you personally! It´s after all through advertisement. So yeah, I believe most people also always hope that they could possibly make some money through Youtube- just nobody admits it. After all some YouTubers make millions- it seems on one site so easy to make money on Youtube (but it´s not!). And with the new YouTube requirements it will only be harder to make any money (you need to have at least 1000 subscribers and a total watch time of 4,000 hours in the past 12 months to be accepted in the program). But is it really worth it to make money off on Youtube? Here it comes... drum roll please: I average on $100 a month. Ha! That is seriously NOTHING compared to all the work I put into this. So, if you think you can make money on YouTube, think again! You should seriously have fun on YouTube, because you won´t really make any money. BTW, if you like to know how much certain YouTubers make, Socialblade´s website is pretty helpful! Type in your favorite YouTuber and you will be surprised how much (or how few) they make. My yearly estimate on socialblade is pretty accurate (on the higher end of the given range). Like I explained in my back-story in the beginning of this article, YouTube has changed and the negativity and trolls on there multiply weekly. So much hate! Hurtful comments, mean people... it is getting out of hand! It is not easy to stay above all that! If you want to succeed on YouTube, you better build up that protection wall right now, cause you will need it. ...and they get more by the day. I feel like comments such as: "Hey amazing channel, subscribe to mine too, I do makeup tutorials too" have quadruplet over the years and it does not seem to slow down. Everybody including your grandmother is now on Youtube... so just remember, you are only 1 person out of 1,300,000,000 that upload 300 hours of video to YouTube every minute! Now imagine how much that reduces your chances of having success? All that competition. You gotta be a REAL GOOD (& tough) girl (or boy) to make it! So, there you have it! The 11 reasons, why you (and I) probably will never become rich and famous on Youtube!